In a biker’s world, there is no better way to put a ring on it, than heading to the Rally and getting married right on the spot. How does a Rally honeymoon sound to you? Tina and Bobby Owens, along with three other biker couples, got married during a mass biker wedding on Saturday at the Sturgis Rally. Donny and Teresa Cox came all the way from Texas and renewed their vows during the ceremony. Ever thought about doing something similar? 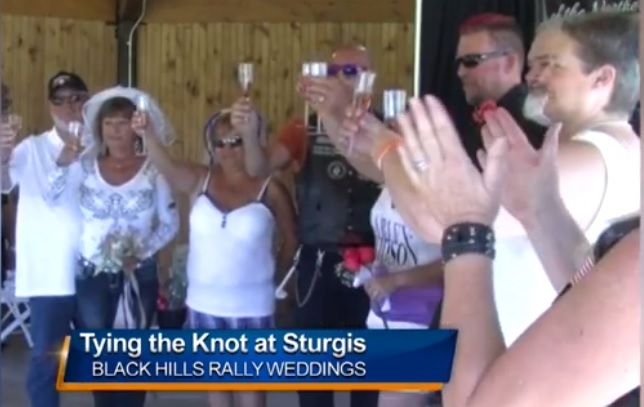 (via KSFY) Black Hills Rally Weddings revved into town about 8 years ago – but this was the first year they held a mass ceremony – with 4 couples walking down the aisle. The family–run business says this is the start of a Rally tradition in Lead and they hope next year will be even bigger.